As previously discussed. Karl Marx focused on the exploitation and oppression of the proletariat (the workers) by the bourgeoisie (the owners or capitalist class). Max Weber recognized the importance of economic conditions in producing inequality and conflict in society but added power and prestige as other sources of inequality. Weber (1968/1922) defined power as the ability of a person within a social relationship to carry out his or her own wilL despite resistance from others, and prestige as a positive or negative social estimation of honor Weber, 1968/1922). C. Wright Mills (1916-1962), a key figure in the development of contemporary conflict theory, encouraged sociologists to get involved in social reform. He contended that value-free sociology was impossible because social scientists must make value-related choices-including the topics they investigate and the theoretical approaches they adopt. Mills encouraged everyone to look beneath everyday events in order to observe the major resource and power inequalities that exist in society. He believed that the most important decisions in the United States are made largely behind the scenes by the power elite-a small clique composed of the top corporate, political, and military officials. Mills's power elite theory is discussed in Chapter 14 ("Politics and Government in Global Perspective). 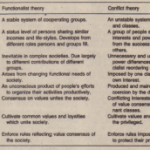 The conflict perspective is not one unified theory but rather encompasses several branches. One branch is the neo-Marxist approach, which views struggle between the classes as inevitable and as a prime source of social change. A second branch focuses on racial-ethnic inequalities and the continued exploitation of members of some racial-ethnic groups. A third branch is the feminist perspective, which focuses on gender issues.